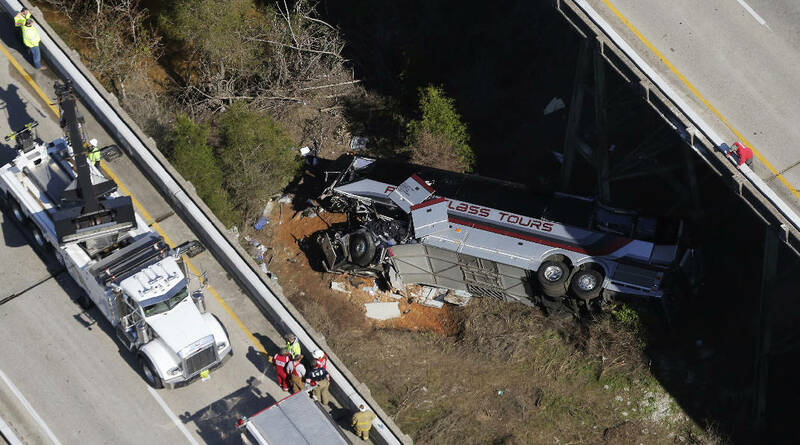 BIRMINGHAM, Ala. (AP) — The driver of a charter bus carrying members of a Texas high school band was unresponsive before the vehicle crashed on Interstate 10 in south Alabama, injuring dozens, federal investigators said Tuesday. The National Transportation Safety Board released a preliminary report on the accident that occurred in south Alabama while the bus was carrying 46 students and adults from Channelview High School near Houston. Several dozen people were taken to hospitals after the bus swerved out of its lane and plunged down a ravine. The 65-year-old driver, Harry Caligone, was the only fatality. The report said there was no evidence Caligone tried to brake, and a passenger said the driver seemed unresponsive as the bus swerved. The unnamed passenger tried to revive the man before the wreck, the report said. The wreck happened March 13 on an isolated stretch of I-10 between Pensacola, Florida, and Mobile, Alabama. Band members were headed home after a trip to Disney World in Orlando, Florida. The westbound bus was traveling about 59 mph (95 kph) when witnesses saw it swerve across the median and into the eastbound lane, where it struck a barrier before shooting back into the median and flying off the edge of a concrete ravine, the report said. The report didn't indicate why the driver might have been unresponsive, but a report released previously by the county coroner indicated Caligone died of blunt-force injuries received in the crash. First Class Tours Inc., the bus operator, said Caligone was a longtime driver with the company. He had been a bus driver for more than two decades.